This issue is accompanied by a music compilation called, Love, This Might Work. Inside, you'll find interviews with Arizona hip hop duo Obey The Altar Native (made up of producer DenOne and emcee Obey); Colorado-based rapper/singer D.Cure; Ohio native rapper Dirty Needles; and Japan-based rapper Sonny B. There are also album reviews of Calvin Valentine‘s Plush Seats, Elaquent‘s Celebrate Life!, Phonte‘s No News Is Good News, Moment‘s Moments, Paolo Nutini‘s Caustic Love, Michael Kiwanuka‘s Love & Hate, Kelela‘s Take Me Apart, Camille‘s Oui, The New Respects‘ Here Comes Trouble, and Lando Chill‘s Maya, Maia, Mayu. Get the scoop on singers BOA and Kyan Palmer in the SOUNDCHECK section. 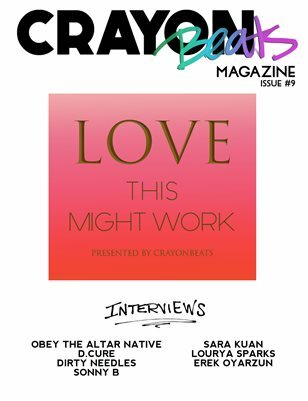 Art interviews with Sara Kuan, Lourya Sparks, and Erek Oyarzun.